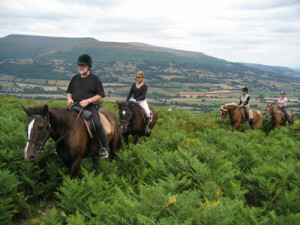 A popular and flexible 2 – 8 day horse riding holiday based here at The Blaenau, riding out each day into the surrounding Black Mountains. This is the ultimate all-inclusive horse riding holiday, with everything taken care of, so that you can simply turn up, sit back and relax in the knowledge that we’ll look after you. 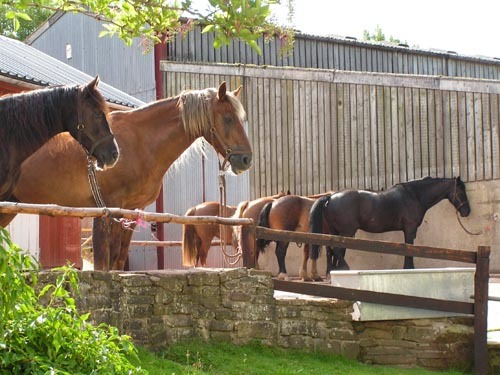 Staying right here in our beautiful traditional 400-year-old Welsh Longhouse, you’ll adventure out each day on an exciting trail ride, stopping at a local pub or cafe en-route for lunch. We make sure you have plenty of energy for all the riding, with home-cooked breakfasts and sociable dinners, based on locally-sourced food. This holiday is suitable for all levels of rider, as we have lots of flexibility to change routes and horses during the week. Our local trails will put you and your horse through your paces over the most varied of terrains. Mountain and moorland tracks, valleys and pasture land; we will take you through some of the most beautiful parts of the Welsh countryside. Our home-bred nimble Welsh cobs are ideally suited to the rough and hilly ground. Guests are invited to take part in catching, grooming, and tacking up the horses, and are encouraged to develop a relationship with their horse. By the time we mount up on the first day, riders will feel relaxed and comfortable with their horse. Each day we ride different trails – usually between 8 and 15 miles a day, stopping for lunch at village inns or remote picnic sites high up in the Black Mountains. We return to the Blaenau each night for a well-earned dinner and a comfortable bed. You will ride up and down steep slopes, cross lofty summits, wade through rocky rivers, pass through dense woods and see the best of wilderness Wales. Our cobs have fast acceleration, perfect handling and automatic survival instinct! Running on grass and water, they’re more environmentally friendly than any machine! At the end of the week, you will be a more relaxed, confident and knowledgeable rider, and hopefully be ready and keen to try one of our longer and more challenging trails next time. Non-riding partners are also welcome at half-price, and can enjoy the fantastic walking or biking right from the door, and can even meet the riding group at the pub for lunch for a more sociable experience! Some guests also choose to take a day or half-day off from riding, and visit one of the local towns (Hay-on-Wye is always popular for bookshop browsing!) – so it really is a riding holiday centred around your relaxation and enjoyment. The cost for a week includes six nights accommodation, all meals except for one night where you’ll eat out at a local pub, and five full days trail riding. Drinks at the pub during lunch are not included. During Black Mountain Explorer weeks, we also offer shorter breaks, so please don’t hesitate to enquire. For more information about our Family Specials during Half Term weeks please enquire. Please note that on Tuesday evenings we take a night off cooking, and ask the group to eat out at the local pub – there is an excellent one just at the end of the road for starters, or you may wish to explore further afield. Wherever you choose, we’ll help with booking and transport where necessary. Please do have a look at our Facebook page where we upload plenty of pictures from each trail that we complete as the season goes on – they will give you a real idea of what our holidays are like!  Just click on the little green F down the side of this page! 6 nights dinner bed & breakfast, 5 full days trail riding, except one night (usually Tuesday) when guests eat out. Mid Week Breaks also available during these weeks - from 2 nights/ days - please enquire. Also possible to extend the break into the weekend with a Hay Loop, staying away Saturday night and finishing Sunday - please enquire.